Remember a time when the only girl specific bikes were pink and had a basket on them? Or remember being a bit older and wanting a high-performance bike but having to settle with a men’s or unisex model? Over the last few years, bike manufacturers are seeing the need to make bikes for female riders. These bikes are designed to improve the riding experience and the performance for both recreational and professional riders. 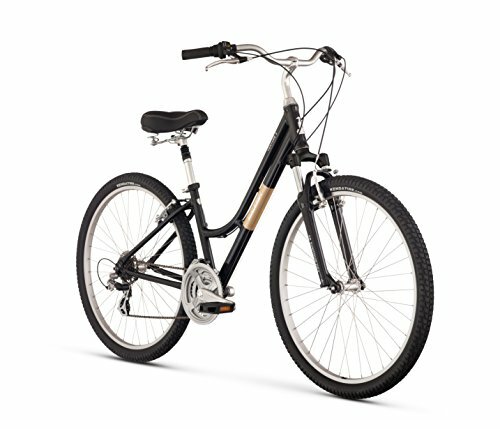 Raleigh Venture 3.0 Comfort Bike Company is one of the leading bike manufacturers in the world. Founded in 1890, they have the strong history of making high-quality bikes for both male and female riders. The Raleigh Venture 3.0 Comfort Bike is a high-performance women’s bike that offers riders a lightweight, safe and reliable option for riding harsh terrains. The lightweight and durable Women’s specific “true comfort” frame is designed to make women feel safe and comfortable bike riding. The bike is sized and shaped using women’s specific geometry, giving it a low standover and a shorter reach. Many women feel uncomfortable when using men’s or unisex saddles. To prevent this, the Bikes Venture 3.0 features the Raleigh Women’s Plush Saddle found on some of its other women’s models. The Bikes Venture 3.0 also has Women-Specific Raleigh comfort bike grips to prevent any discomfort while riding. The bike sizing is also done specially for women, with the XS model ideal for women at 5-foot and the large model designed for women at around 6-foot. The Venture 3.0 comfort bike makes use of Shimano components to ensure smooth and reliable gear shifting. Shimano is a Japanese manufacturer with a long history of making parts for both recreational and professional bikes. This bike uses a Shimano twist Shifter to help ensure that riders are always in the correct gear. The Shimano 21-speed setup keeps the bike moving safely and efficiently. Unboxing and assembling a bike can be a scary thing for beginner riders. Because the Raleigh Venture 3.0 is built with beginners and city riders in mind, the unboxing and assembly of the bike are made to be as simple as possible. The actual riding experience is also ideal for anyone new to biking as the bike is not very complex to us. This bike may not be suitable for any advanced mountain trails as one would probably want a more professional bike for that. This makes the Venture comfort bike an excellent option for young riders who are getting started in mountain biking. Price is often a very key part in deciding on which bike to choose. Many high-end comfort bikes are very expensive and out of most people’s budgets. The Venture Comfort Bike high-quality parts and materials and is made by one of the most respected bike manufacturers in the world. Even with the high-quality design, the Raleigh Bikes Venture is still at the lower end of the price range. By offering the bike at such an affordable price, Raleigh is making it easier for young and inexperienced riders to become familiar with city biking. Although the bike is listed as an affordable bike, the Venture is designed to make it suitable on many different terrains. Since this is so easy to ride and control it is perfect for everyday use as a general commuter bike. For one, the bike is also designed not to look too heavy and bulky when on the road. This uses upright geometry ensures a comfortable riding position and eases pressure on the neck and lower back. This helps in making long journeys on pavement or grass a much more enjoyable experience. Finding the right women’s bike is not an easy task. The Raleigh Bikes Venture gives women a chance to put comfort as a priority as the lightweight bike is explicitly made for female riders. This bike offers excellent quality and is offered at a very affordable price. The Venture Comfort Bike is more suitable for young or beginner riders as it is not designed to handle advanced trails very well. Experienced and professional riders will be better suited to choosing a more advanced and more expensive model for their city biking.